With countless fans across the U.S., the GEICO Gecko mascot represents a culmination of everything we love. He is cute, relatable, an animal and has a foreign accent. What else could you ask for? The folks at GEICO wanted a way to stand out at festivals, conventions, sporting events and more… so we gave them just that. The spitting image of the country's best-known lizard was born weighing in at 105 pounds and standing two-stories high. Because he's in inflatable form he's portable, easy to setup and take down, and a breeze to ship from event to event. 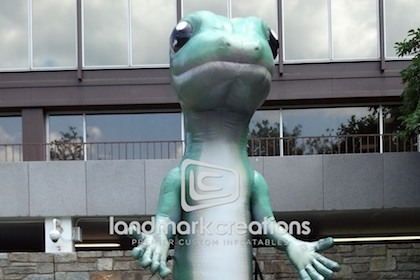 But out of all the inflatable companies in the nation, why did GEICO choose Landmark? They recognized quality when they saw it. According to Brandon Golatt, Event Marketing Coordinator, "We decided to use Landmark because we were impressed with work that they had done for a partner of ours on our behalf. We were very impressed with Landmark’s attention to detail so we decided to see what they could do for us. We are very pleased with the result."